Today . . . I am reflecting on the article I read in the Kansas City Star called Thinking right in a left-brain environment. It's an article sent to me by my good friend, Dr. Robin Lipke, who shares my interest in right and left brain thinking. What I found interesting about this article was the marriage of music and business -- the very same combination of strengths I bring to the table as a small business consultant, and Beverly Sills brought to the business world of New York's Metropolitan Opera. I've included the first part of the article for you to read, in the hopes that it will generate discussion. Lori Diffendaffer, who holds a bachelor’s degree in music performance and a master of fine arts in performing arts management, finds that her musical background is right in tune with her job as a marketing senior associate at Grant Thornton LLP. In a business firm full of CPAs, an MFA stands out like an oboe in a room full of calculators. Yet Lori Diffendaffer says the degree and her musical background prepared her well to handle marketing at Grant Thornton LLP in Kansas City. Diffendaffer is a marketing senior associate at the accounting, tax and business advisory firm. She works with accountants, auditors and business advisers to write promotional pieces, prepare proposals, create direct mail campaigns and plan special events. “Whenever I write a piece, I consider if the tone is right, the voice is right — skills I applied in music — but in a more abstract way,” she said. Her job requires creativity, empathy and an ability to see the big picture — what are called “right-brain” skills because they originate in the right hemisphere of the brain. The skills that make her stand out in a left-brain environment are becoming increasingly important in all jobs, maintains author Daniel H. Pink in Whole New Mind: Why Right-Brainers Will Rule the Future. Left-brain skills — linear thinking, logic and analysis — still have a role to play, Pink writes, but success belongs to those with a skill set that also includes imagination, a sense of humor, intuition and understanding the needs of others. So, what do you think about this discussion? Do you agree with Danial Pink? Do you think right-brainers will rule the future? Weigh in. I'd like to hear your thoughts. As a singer, I've studied both western and classical Indian music, and it's interesting to note that Indian music is a purely oral tradition. Songs are taught from master to student. The student's primary learning tool is "listening", not reading music. I think the best musicians in the west are also those who "get" music on a more intuitive level, through truly listening, rather than those who are techinically astute but less intuitive. However, a purely "emotional" musician is also missing the boat. Technique is very important! I believe that those who can use BOTH sides of the brain will rule the future. Being intuitive without being practical is incomplete, and vice versa. Music is a perfect example of this. I don't know what will 'rule the future,' however, for what I see as a wonderful example, Bill Harris, a participant in the "Masters of the Secret" DVD, is an extremely successful businessman, and his most noted creation is "Holosync", a state of the art CD program balancing left and right brain function using sound technology, created for anyone wanting to live fully with joy, peace, spirituality, success and productivity. Right-brainers won't rule the future--they won't have a secure future unless they have some left-brain skills. As the others have observed, you need both--but not just one--to be successful in getting along with others both in your public and private life. I still remember watching the students during lunch time from my teacher's seat in the lunch room. I saw Janet Buzzinotti take her tray to the disposal area and though she looked the same as always I knew something was wrong. I went up to ask her and she burst into tears. Her brother had run away from home. To be sensitive to the needs of others, teachers (and this applies to any work relationships) need to know how each student walks, their normal complexions and expressions and tone of voice and the other characteristics that make the person. Only then can you be sensitive to deviations from the norm in order to help. Some deviations are visual and auditory but others, like Janet, are intuitive (vibrations for the psychics--your inner Samurai for others). I believe our society is headed for whole-brain thinking. We each need the imagination, creativity of right-brain thinking in which we get an overall view of a vision or project. It takes the left side to create a logical step-by-step plan to make it happen based on details. As the plan evolves, the person uses both sides seemingly simultaneously as the creativity and details converge. Also, it seems that so many people are leaving traditional jobs that require skills that are one-side dominant. Many people are going into business on their own which requires whole-brain thinking. Does it mean I'm a right-brain thinker if I had to check the post to figure out which side of the brain was the creative one? I think a lot of us agree that both right and left are important. As far as music, I think the ability to appreciate it, and share that appreciation, is a way to connect to people, and that helps any situation. Like the person who write the article said, "...success belongs to those with a skill set that also includes imagination, a sense of humor, intuition and understanding the needs of others." Whether it's connecting to my Dad through his old 45's, or liking the same music as my 6th grade students, or referring to music in business activities, recognizing the importance of music means recognizing that small pleasures like music really matter to people and make our lives fun. Even in work, we want fun. You make an interesting point, Muzetta, that more people are leaving traditional jobs that are primarily one side dominate in favor of starting up their own business, that is more whole brain oriented. Thanks for adding this thought to our conversation! Mary Ellen, your comment about balance in music prompts further exploration. Music from the Baroque period (1600-1750) is a fabulous example of left-brain oriented music. Where as music from the Romantic period (1820-1900) is much more right-brain oriented. The Classical period, in between the Baroque and Romantic periods does a beautiful job of marrying the two. Seems like we've been exploring that balance in music for centuries! Ah yes, Holosync. Thanks for bringing this amazing to experience CD into our discussion, Susan. Has anyone else listened to Holosync? It's really delicious to experience, though not while you're driving! Frank, you're right. Right-brainers will never rule the future. Nor will they ever rule the business world. Those who develop whole-brain thinking, as in the example you gave, are those best situated to take in the whole of what's happening and take action accordingly. 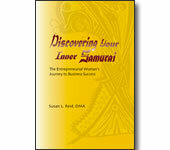 This is the powerful place of Inner Samurai inspired action. Stamford, if you had to check the post to see which side of the brain was the creative mind . . . means that your left-brain is alive and doing well! Congrads!